Like most writers with an on-line presence, I get emails from readers. Most of it is generated by two different series, both of which came to rather abrupt ends when I thought they were going to continue but the publisher ultimately thought otherwise. So several times a week -- occasionally several times a day -- I get an email wondering when the next book in one of those series is going to come out, and I have to write a sheepish reply informing the reader that, uh, there isn't going to be a next book. Today, however, I got emails from two different readers concerning a couple of books that I wrote well over a decade ago, neither of which was a great success, but both of which I enjoyed writing. 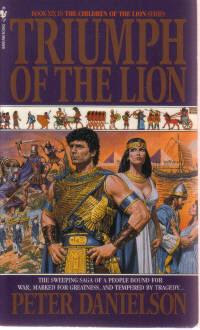 TRIUMPH OF THE LION was the final book in the Children of the Lion series. These were Biblical historical novels set during Old Testament times and packaged by Book Creations Inc., the Lyle Kenyon Engel-founded outfit responsible for many different historical novel series during the Seventies, Eighties, and Nineties. I worked for BCI for a number of years and wrote at least 50 books for them, maybe more. I had read some of the Children of the Lion series, but that was my only connection with the series until one of my editors at BCI called and asked me to write #19, which was the final book on the contract with Bantam. There was a possibility that the series might continue past that, however. I had never written any Biblical fiction, but I was raised in the Baptist church and grew up going to Sunday School, so I knew all about King David and the Philistines and such-like. Or I thought I did, anyway. I wound up doing considerable research for the book, which was the fourth and final part of a story arc within the series started by another author. I'd been writing mostly Westerns for BCI, and in fact was working on a series Western at the same time as I was writing the Children of the Lion book. I told my editor that I'd be careful not to have King David say, "Well, I reckon I'll go slay me some o' them Philistines." I quickly discovered that sword fights were just as much fun to write as gunfights, and battles with a bunch of guys in chariots weren't that different from Old West cavalry battles. I had a great time with the book. I finished off the other author's storylines (to this day, I don't know why he didn't write the book and why BCI called on me instead), and I set up some stuff of my own in case the series continued. Sadly, it didn't. I had some pretty good ideas for it, I thought. The other book a reader emailed me about today was THE HEALER'S ROAD, a Civil War historical novel co-authored with Livia and published under the name J.L. Reasoner. We'd done another historical novel for Berkley under that name, a Gold Rush novel called RIVERS OF GOLD. The editor wanted a novel about a family of doctors during the Civil War. This was the first time I had written anything set during that era, and researching it was good practice for all the research I had to do a few years later when I started writing the Civil War Battles series for Cumberland House. THE HEALER'S ROAD was a lot of fun, too. We threw in more than just the war, of course. We also had lust, obsession, greed, doomed love, and all sorts of soap-operatic complications for your characters. But there were also some serious scenes, and some darned good ones, too, in my biased opinion. The book did well enough that there was a sequel, HEALER'S CALLING, following the same characters after the war, during Reconstruction and also moving westward. There was talk of a third book, but it never came about. At the end of the first book we left it rather vague as to whether or not a certain character who appeared to be dead was really still alive. When people asked me about him, I would say, "Well, if there's a third book, he lived, because he's going to reappear. If there's not . . . I guess he's really dead." These books are fairly rare now, although the two HEALER'S books can be found very cheaply -- I mean, inexpensively -- through on-line booksellers. Copies of TRIUMPH OF THE LION can be found on-line, too, but they're more pricey, I guess because by that time the print runs were pretty low. I think they're good books, and I'm glad that they haven't been completely forgotten. And I thank you for allowing me to wax nostalgic this evening. It takes me a long time to read a book these days, a combination of being really busy, not having much time to read, and a rather scattershot attention span. 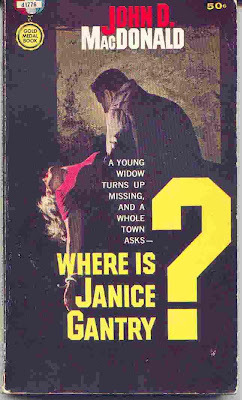 But even though it took me about a week, I read John D. MacDonald’s novel WHERE IS JANICE GANTRY? and enjoyed it quite a bit, especially after reading the disappointing A MAN OF AFFAIRS by JDM earlier in the year. I liked the narrator/hero in this one, Sam Brice, a former pro football player and insurance appraiser who lives in a small town on the west coast of Florida. Trouble comes into his life in the form of a young acquaintance of his who has escaped from prison and needs his help. Somewhat against his better judgment, Sam goes along with the request, and that sets in motion a series of violent events that include the disappearance of his former girlfriend, the Janice Gantry of the title. On the recovery from the fire front, we’re making steady but frustratingly slow progress. We haven’t been able to move into the mobile home on our property yet because it’s taken longer to get the utilities hooked up than we thought it would. We’re hoping to get in there this week so we can really get started on cleaning up what’s left of the old house, as painful as that’s going to be. It’ll certainly be nice to be back in a place of our own, though. As for writing, I get pages done whenever I get the chance. I’ve recreated well over half of what I lost on the current manuscript. It’s been an interesting experience, rewriting that much of a book that I had written before. The storyline is the same, and most of the scenes are, too, but most of the words are different and I’ve added some things and left out others. Definitely a weird sensation, and one that I hope I never have to go through again. All in all, though, we’re plugging along and doing okay. Continued thanks to all of you who have helped us out, and are still helping us out, in so many different ways. Those of you who are fiction junkies like me will probably understand when I say that even under dire circumstances, the urge to read is still there. So it won’t come as any surprise to hear that I’ve been scrounging books off my in-laws’ shelves while we’re staying here. My attention span isn’t what it once was, but I’ve managed to read two books since we’ve been here. A MURDERER AMONG US is one of Carter Brown’s novels about Hollywood troubleshooter Rick Holman (who might just be, one speculates, the illegitimate son of Dan Turner). In this case, however, even though Holman is working for a Hollywood producer, he’s off to the East Coast to find out who’s been trying to murder a movie star who wants to improve her image by appearing in a Broadway play. The book is full of eccentric characters, the style is as fast and breezy as always in a book by Carter Brown (really Alan G. Yates), and the plot has a twist or two more than usual. None of these books are more than light entertainment, but A MURDERER AMONG US functions pretty well in that role. Archie Joscelyn, who also wrote as Al Cody and Lynn Westland, had a long, prolific career as a Western author. He was capable of turning out some good novels, like DOOMROCK and THE THUNDERING HILLS, but he was also very inconsistent, turning out a lot of bad books, especially late in his career. THE GUNHAND, published under the Al Cody name, is from 1966 and falls somewhere in the middle, although it tends toward the mediocre side. The story concerns a couple of down-on-their-luck cousins, one stalwart and good, the other somewhat shady. They find a gun that belonged to a famous outlaw, and its evil influence (Joscelyn was big on sinister, vaguely mystical objects) turns the more disreputable cousin all bad. There’s a stagecoach line owned by an old-timer who has a beautiful daughter (of course), a gang of desperadoes, assorted shoot-outs and double-crosses, and a plot with enough coincidences and contrivances for a dozen B-Western movies. Still, there’s a great scene at the end with a runaway stagecoach that almost redeems all the ludicrous plotting and bad writing. Almost. Don’t run out looking for this one. But despite that, I was still glad to have it on hand to read. 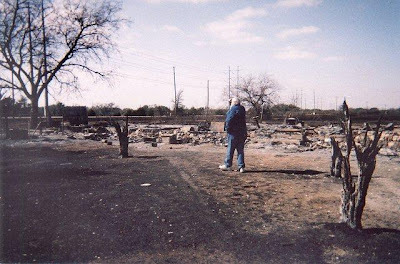 Today was the first day since the fire that I was able to sit down and spend most of the day writing. I was a little worried about how it would go. I’ve been able to do a couple of pages here and there but nothing really significant. I didn’t know if I still had it in me. I’m heaving a big sigh of relief now, because today’s output would have been a very good day even in our old place. I also made some notes about the part of the book that I lost, so maybe I can recreate it without forgetting too much of what I had done. Of course, it won’t be exactly the same – I’ve already changed a few things deliberately – but that doesn’t really matter. And best of all, it was still fun. Maybe I can do this after all. 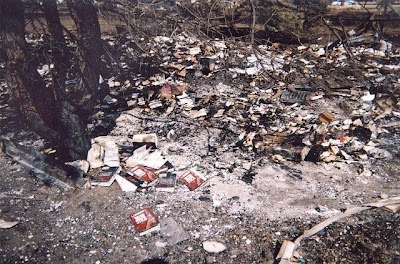 This was the last book I read before the fire, and I had written some comments on it that I never got to post. However, it's too good a novel not to at least mention it. It's a debut novel, but you'd never know that by the smooth, powerful prose that Bell uses to tell the story of Jett Dormer, who salvages abandoned cars from a closed-off city inhabited by mysterious creatures left behind when terrorists poisoned the water supply. Set in an unspecified but not too distant future, THE CONDEMNED is just the sort of book I like. It's fast-paced, had fine characterization and plenty of action, and is told in a lean, hardboiled style. 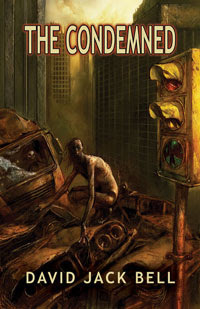 Even though it's being promoted as a horror novel and comes from a publisher known for horror, Delirium Books, it strikes me as more of a science-fiction novel, and a mighty fine one, at that. I wrote two pages today. Could've done more but didn't have a chance to spend much time at the computer. That won't get me caught up, but it's a start. Awe-struck. Humbled. And very, very grateful. That pretty much describes how I feel about the incredible outpouring of love, concern, and support from all over the world following our fire last week. I just can't tell you how much we appreciate each and every one of you. We have some laptops to use now and should be on-line with some regularity from now on. We're staying with Livia's parents for now, but we've made arrangements to have a mobile home moved onto our property so that we can live there while our house is being rebuilt. After some debate, we've decided to rebuild in exactly the same spot -- just a lot more fireproof this time! Physically we're okay, although we breathed enough smoke on Tuesday and enough ashes since then that we're coughing and sneezing and hacking a lot. Couldn't sleep or eat much for several days, but that's slowly getting back to normal. Max, the big dog who escaped from the front yard, has a burned paw and is limping around, but he's okay otherwise. We lost three wonderful cats, Fulton, Rockport (aka Rocky), and Montana; Cotton Candy, the World's Oldest Parakeet; and Festus, the last of our Nigerian dwarf goats. Here's to them, good animals all. 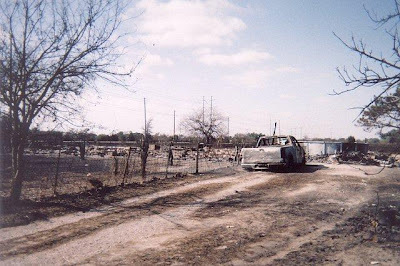 The fire department has determined that the fire started about half a mile from our house, behind another house where the owner had burned a trash pile the day before. The theory is that even though the trash pile appeared to be out, the high winds stirred it up and rekindled it. Can't prove it, though. To those of you who have sent money, thank you so, so much. Even though the place was insured, there are going to be a lot of extra expenses that insurance won't cover. You never realize how much you have to replace when you lose everything. To those who are sending books . . . this is absolutely wonderful. To go from being surrounded by tens of thousands of books to none in a matter of minutes is almost more than the mind can comprehend. Any and all book donations will be hugely appreciated. We can use copies of the books we wrote, research books, fiction of all sorts. Luckily my in-laws have a few books and I've been going through them for reading material, even though I haven't always been in much of a mood to read. Lastly, I'm just now starting to go through the hundreds of emails I've gotten in the past week. I plan to answer all of them in the coming days, but for now let me say again, thank you all so much. We are truly blessed to have you for friends.